In both Maryland and Washington, D.C., it is a crime to operate a vehicle while impaired by alcohol or drugs. The severity of a “Driving under the Influence” or “DUI” charge depends on the specific circumstances of the situation. Not all DUI charges come as a result of a driver being heavily intoxicated. It is a common misconception that if a driver’s Blood Alcohol Concentration (BAC) is under .08%, he or she cannot receive any criminal charges for driving. If your BAC is above a .08%, you may automatically be charged with a DWI, or “Driving While Intoxicated,” even if you were driving reasonably well. However, if you have alcohol in your system and your BAC is below .08%, but you also fail a Field Sobriety Test or indicate your impairment by driving poorly, you could still be charged with a DUI, or “Driving Under the Influence.” A prosecutor may show that you have committed a DUI by proving that you were driving poorly (i.e. swerving, disobeying traffic laws, etc. ), that your eyes were bloodshot and glassy, that you smelled of alcohol, or any combination thereof. Proven the same way as a DUI, you may still be charged with a lesser offense, known as an OWI, or “Operating a vehicle While Impaired.” An OWI typically carries lighter penalties. In the District of Columbia, an OWI carries with it up to 90 days incarceration and a $500 maximum fine. A driver charged with a DUI or DWI could face serious penalties even if it is his or her first offense. In both D.C. and Maryland, a driver could face a $1,000 maximum fine for his or her first DUI offense. In D.C., he or she could also face a maximum of 180 days in jail, and in Maryland, a maximum of a year in jail. These penalties increase if the driver has prior DUI convictions. In addition to fines and jail time, a driver charged with a DUI will often face license restrictions. For a driver’s first DUI offense in D.C. or Maryland, his or her license may be revoked for six months. If a driver under suspicion of a DUI refuses to submit to a chemical BAC test in D.C., his or her license may be suspended for a year. For a second or subsequent conviction, the amount of time can increase to up to two years. If a driver does the same in Maryland, his or her license may be suspended for 120 days if it is a first offense, and a year if it is a second offense. If you have been charged with a DUI, you may feel as though your fate has been decided and that your life will be permanently impacted. However, this isn’t always the case. There are often possible defenses that may be raised in order to lessen the severity of your potential sentence, or even possibly get rid of it all together. 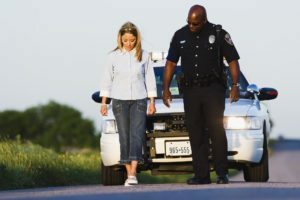 For example, even if a police officer pulls you over and eventually finds that you have been driving under the influence of alcohol or drugs, there may be a possible defense against this if the officer did not follow proper protocol or never had a legitimate probable cause to require you to pull over in the first place. An experienced attorney can look at videos received in discovery to evaluate if the officers conducted tests properly and if the breath machine or implied consent was properly administered. It is important to have an experienced DUI attorney to examine the specific facts and circumstances of your case in order to recognize these scenarios and prepare the best possible defense. Each case and the circumstances around that case must be looked at by an experienced and reputable attorney that understands Maryland and DC DUI/DWI/OWI laws and the court system. If you are facing DUI charges, contact the experienced attorneys at Bruckheim & Patel to help you handle your case and get your life back on track. Let one of our experienced attorneys help you navigate the complicated court system.